worldwide starch production is based on the raw materials such as corn, potatoes, tapioca and wheat. starch phase, and form a water-resistant starch plastic. and softeners as a filler for tires. year 2010, the worldwide capacity of starch polymers is estimated at 200-300 kt per year. After cellulose, starch is the most important renewable raw material. The overwhelming portion of worldwide starch production is based on the raw materials such as corn, potatoes, tapioca and wheat. Worldwide today, every year more than 45 million tons of starch are produced industrially, of which a good 10 million tons are produced in Europe. Thermoplastic starch along with (modificated) renewable polymers is used to produce starch blends. About 80% of the biopolymer market is covered by thermoplastic starch. As a blend partner, starch may be used to increase strength and reduce costs. Furthermore it enhances the biodegradability of the material and therefore increase the degradation rate. The proportion of starch in the materials may amount to up to 70%. In this case, the thermoplastic starch is frequently mixed with water-repellent, biodegradable polymers. The plastic blends accordingly are composed of two phases, of the continuous and hydrophobic polymer phase and also of the dispersed and hydrophilic starch phase, and form a water-resistant starch plastic. The bioplastics from starch are used mainly in the packaging sector, in catering, the agrarian sector, gardening and landscaping but also for personal hygiene articles, textiles and medical technology as OP material or capsules. In the automobile industry, starch is used together with synthetic materials and softeners as a filler for tires. 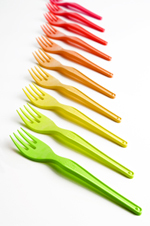 Bioplastics from starch are available at a price of €2.00 and €4.50 per kg depending on type. For the year 2010, the worldwide capacity of starch polymers is estimated at 200-300 kt per year.